Is the most common endodontic procedure. 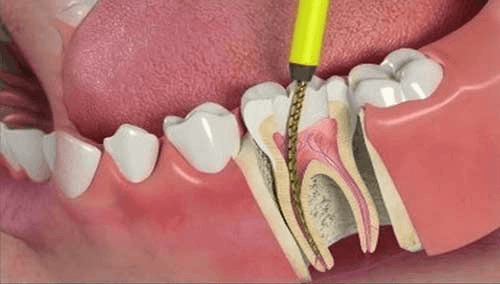 if the dental pulp is affected by bacteria from dental decay than it has to be treated endodontically by extirpating the pulp and performing a root canal treatment. After removing the pulp, the dentist cleans and shapes the root canals and fills them with a permanent material. The pulp can be also affected by traumatic injuries, repeated dental treatment and more. It is successful in more than 90% of the cases. Endodontics is a part of dentistry that deals with infections and inflammations that affect the inside of the tooth. So when the dental pulp is infected or inflamed it has to be treated with a root canal treatment. If that doesn’t happen, the patient might lose the tooth. The most common reason that causes infection is dental caries. If decay is not treated it spreads to the dentin and later the pulp. Once it has reached the pulp, the only way to save the tooth is a root canal. Dental trauma is another reason why a patient would need this procedure. Fractures, cracks, and chips can happen to anyone. The symptoms include pain that is very sharp. It can be present at all times or it can be stimulated by hot and cold drinks and food. There can be swelling, bad smell, red gums, or even no symptoms at all. These teeth can have a dark color in some cases. It is a very common procedure, that saves millions of teeth every day. Extraction is the last thing you want to think of. Root canals are successful in a high percentage of the cases and these teeth can stay for many years in the mouth. Before the procedure, the dentist will inject an anesthetic so that the patient doesn’t feel any pain. He always has to look at X-rays to make sure that he’s doing the right thing. The procedure starts with cleaning the decay and forming an entry cavity. The dentist has to completely remove caries and form a clean cavity. He will then have to remove the pulp in the coronal cavity. The next step is to find the entrances of the root canals. Some teeth have only one canal, while others have multiple. In order for the root canal procedure to be successful, the dentist has to find all the canals and clean them properly. By cleaning, it means to completely remove the pulp and shape the walls. Once this is done, the dentist will seal the canals with special materials. The whole point is to remove all debris and bacteria, provide a clean space and seal it with materials to avoid leakage and the entering of bacteria. Next, the crown has to be restored with either filling or a restoration. The first choice is filling, but if the caries was destructive, a crown can be the second option. In some cases, the teeth are too weak to be only filled with composite so they have to be covered with a crown.